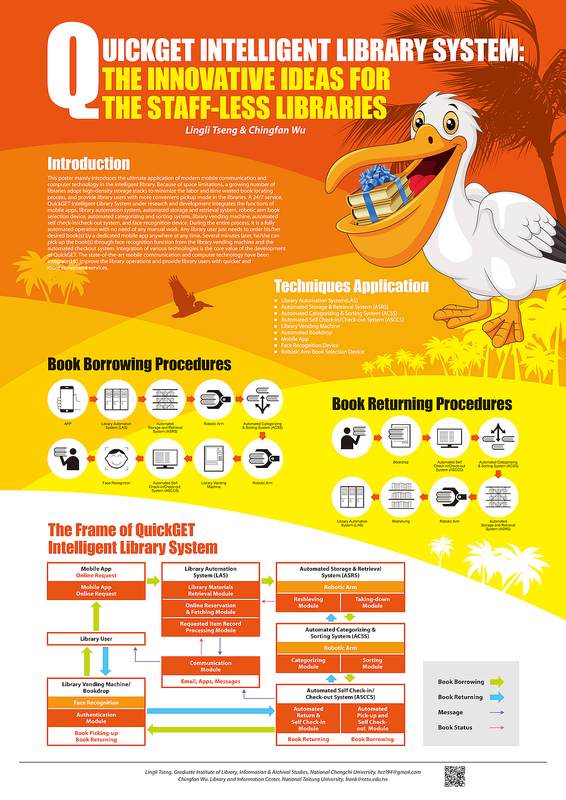 TSENG, Lingli and WU, Chingfan (2018) QuickGET Intelligent Library System: The Innovative Ideas for the Staff-less Libraries. Paper presented at: IFLA WLIC 2018 – Kuala Lumpur, Malaysia – Transform Libraries, Transform Societies in Session 153 - Poster Session. 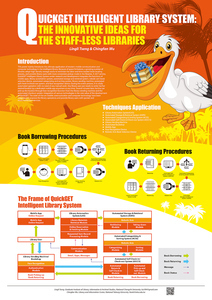 This poster mainly introduces the ultimate application of modern mobile communication and computer technology in the intelligent library. Because of space limitations, a growing number of libraries adopt high-density storage stacks to minimize the labor and time wasted book locating process, and provide library users with more convenient pickup mode in the libraries. A 24/7 service, QuickGET Intelligent Library System under research and development integrates the functions of mobile app, library automation system, automated storage and retrieval system, robotic arm book selection device, automated categorizing and sorting system, library vending machine, automated self check-in/check-out system, and face recognition device. During the entire process, it is a fully automated operation with no need of any manual work. Any library user just needs to order his/her desired book(s) by a dedicated mobile app anywhere at any time. Several minutes later, he/she can pick up the book(s) through face recognition function from the library vending machine and the automated checkout system. Integration of various technologies is the core value of the development of QuickGET. The state-of-the-art mobile communication and computer technology have been integrated to improve the library operations and provide library users with quicker and more convenient services.